If you’re looking for a pleasant and relaxing weekend away from the hustle and bustle of city life, I would suggest taking a drive into the Crocker range to the sleepy valley of Tambunan and trying out a home stay with a local family. Tambunan is a hidden gem of a valley in the interior division of Sabah and I think it’s the most picturesque of a set of three valleys namely, Tambunan, Keningau and Tenom that are found in the interior. 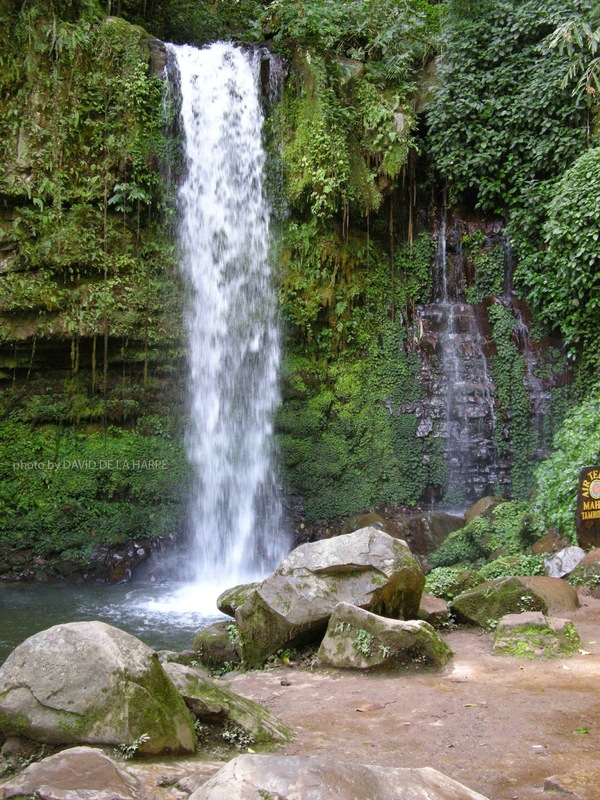 It is located about 80km from Kota Kinabalu, along the road that leads to Tenom. The Tambunan valley is located at an altitude of 750m making it much cooler than the lowlands while the evenings and early mornings are pleasantly cool enough for a cardigan. Gifts from appreciative guest decorate the house. The drive in itself is very scenic once you leave the town of Penampang and start ascending into the Crocker range. The road climbs at a rather fast pace and is full of hairpin turns, however this gives you excellent views of the tree clad mountains, city and nearby islands. There are some interesting stops along the road and one of them well worth a visit is the Kipandi Butterfly Park with its beautiful collection of wild orchids and butterflies. From the park, the road ascends even higher and soon you will pass a few run down restaurants that were once very popular with travellers. They are much quieter now since a new, shorter alternative road was built into the interior from Kimanis. The road soon starts to descend and if you’re in the mood to go hunting for the largest flower in the world, do stop by at the Rafflesia information centre. Check with the rangers on duty if there is a flower in bloom and how far the walking distance is. Some are pretty close to the roadside while others can be a 2 hour trek away. Soon after the rafflesia centre, you will be greeted with views of the Tambunan valley, jade green during the rice-planting season or golden at harvesting season. Either way it is a beautiful sight and provides great photo opportunities. Due to the limited flat land available, the locals have built terraces along the sloping valley and lower hillsides where they have been planting their rice for centuries. It is the only area in Sabah that you will see such extensive terraced rice fields. Another feature of Tambunan is the tall feathery bamboos which grow everywhere and add to the green image of the valley. This is a result of an edict by the British Colonial government in the early days, where the locals had to plant 20 shoots of bamboo for every piece they cut. Due to the abundance of bamboo, it was the main material used in the building of houses and it also lent itself to a variety of household implements and handicrafts. Rice being fermented for Lihing. Tambunan town itself is nothing to shout about, it has the usual typical shops of a small farming town with some local restaurants serving mediocre fare. It’s the people, their way of life and friendly nature plus the scenery that makes the visit memorable. The best way to experience this is to stay at one of the many home-stays that available in the valley. These families that offer home-stays are approved by the Ministry of Tourism and usually a minimum of 10 houses are required to form a village home stay. The concept is more than just a bed & breakfast; it is like being a guest of a local family and joining in the village activities. Many of the homeowners are middle-aged couples with large houses and have unoccupied rooms, as their children have grown up and are either studying or working in the big cities. They then open up their homes and their hearts to visitors who come from afar as the UK, Australia and Japan to stay with them for a night or longer. Many a lasting bond of friendship has grown through these home-stays and evidence of this can be seen in the display of gifts given to the host by their visitors. Flags, tea towels and posters of the home country of their guest proudly decorate the family rooms of these houses. The rice making factory across the river. western toilets and bathrooms and the rooms are usually twin bedded or 1 large single bed. Upon arrival at your designated home, you will be introduced to the host family and suggestions of the various activities that you can join in will be offered. Depending on the season, it could be helping out in the rice fields planting or harvesting, fishing at the family fish pond or picking jungle vegetables from the nearby forest for dinner .If it’s the fruiting season, then it could be harvesting and of course eating what ever is in season, from pineapples to durian. A typical lunch at a homestay. Interested to learn how rice is turned into local rice wine, and then pay a visit to the Lihing factory. This factory is famous for brewing very good quality rice wine. Buy a bottle or two, great to drink over ice or for stewing chicken. You could also visit the bamboo factory to see furniture and other crafts being made from bamboo and also the local cottage industry that produces various ginger products from locally grown ginger. In the evening, when you’re back at your host house, you may want to try out your musical skills by learning to beat the various gongs or blow the Sompoton, a traditional bamboo wind instrument. That is providing there is no party or celebration being organised in the village, as you will definitely be invited to attend. With so much to see and do, your overnight trip to Tambunan just might not be enough and you will have to return to enjoy more of the Tambunan Hospitality.